Your heart is arguably the most discussed organ. It keeps you alive, pumps blood throughout your body and delivers nutrients through the bloodstream. It also evokes feelings; you follow it; you wear it on your sleeve; sometimes it gets broken. It’s lub-Dub sounds can be soothing at times and pounding at others. Needless to say, the heart is an important organ. Cardiovascular disease (CVD) is the number one killer of both men and women in the U.S. Knowing the risk factors for CVD can help better your heart via lifestyle alterations through diet, exercise, and other positive health behaviors. Understand your cholesterol! Monitor your cholesterol levels to avoid hyperlipidemia (high cholesterol levels) that increase your risk for heart disease. Identify if or how your diet, exercise, medications or genetics may alter your cholesterol. Learn what your cholesterol levels mean by discussing them with your doctor and using these references from the American Heart Association (AHA). Read up on everything cholesterol here. Get moving! Moderate to vigorous aerobic exercise can boost HDL (good cholesterol) levels and increase your quality of life. Aim for five 30-minute sessions per week. Fill up on fiber! – Fiber has cholesterol-lowering effects and can contribute to weight loss and maintenance (it keeps you fuller longer). Fruits, vegetables and whole grains will help you reach your daily fiber recommendations (25 grams for women; 38 grams for men). Bonus: increasing your fruit and vegetable intake will also increase your potassium intake, which is beneficial for decreasing blood pressure! Know your fats! The Dietary Guidelines for Americans recommends that 20-35% of your calories come from fat. It’s crucial to identify the types of fat within your diet and understand how they affect your cholesterol levels. Focus on having most of your fats coming from unsaturated fats. 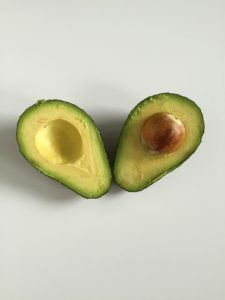 Also known as “healthy fats,” monounsaturated fats are associated with decreased LDL (“bad cholesterol”) levels and inflammation, and are found in nuts and seeds (ex: olive oil and avocado). Limit saturated fats (fats that are solid at room temperature) from animal sources, coconuts, and palm to less than or equal to 10% of your caloric intake, and avoid trans fats (found in baked goods and processed foods), as both are associated with increased LDL levels! Be sure to check nutrition labels for cholesterol as well and aim for 300 mg or less per day. Nix the salt! Foods high in sodium may increase blood pressure. Hypertension (high blood pressure) places the body at risk for stroke, heart attack and kidney damage to name a few. Where does sodium in our diets come from? Processed foods and takeout options are the biggest culprits. Limiting these and avoiding the salt shaker (especially out of habit) will help you cut back on your salt intake. Be sure to check nutrition labels on packaged products to keep your sodium in check! Limit your sugar intake! Studies are finding that added sugars increase the risk of obesity, heart disease, and diabetes. The average American adult consumes about 22 teaspoons (350 calories) of added sugar daily– added sugar meaning sugar that wasn’t in something to start (naturally occurring sugars in milk and fruit are exempt). AHA sugar limits are 6tsp (100 calories) for women and 9tsp (150 calories) for men. To calculate the number of teaspoons of sugar, divide the grams of sugar on the nutrition label by 4. Aim for a healthy weight! If you are overweight or obese, losing weight can reduce your risk for heart disease and decrease your blood pressure. Every bit counts—losing 5 to 10 percent of your body weight will help lower your cholesterol. Stop smoking! Smokers are more likely to develop heart disease compared to non-smokers. If you’re smoking, quit ASAP to achieve greater health. Get some zzz’s! A recent study by AHA found that poor sleep quality is associated with increased blood pressure. Getting the recommended amount of 7-8 hours of sleep may also bring metabolism, weight loss, and mood benefits. Overall win! Don’t stress! Many studies examine how stress increases your risk of heart disease. It may be that stress increases risk behaviors associated with heart disease, including smoking, overeating, increased cholesterol, hypertension and excess or insufficient amounts of sleep. Other research points to stress damaging artery walls or causing irregular heartbeats. Either way, it’s important to find ways to manage your stress in healthy ways! Deep breaths, healthy diets, and exercise will help! Are you taking care of your heart and making sure it’s in tip-top shape? A healthier heart equals a happier and healthier you, so get to it! I want to add in terms of aiming for a healthy weight, we should also look at our muscle to fat ratio. Aim to lose fat, not muscle.